Slicing blades, comfort handles and a red gem. The Haito Kodona slices through hair with precision thanks to the quality of its Japanese stainless steel blades and sharpness of its convex cutting edges. It features a curved thumb ring for optimum comfort, reducing pressure on your thumb and giving your hand a relaxed working position. 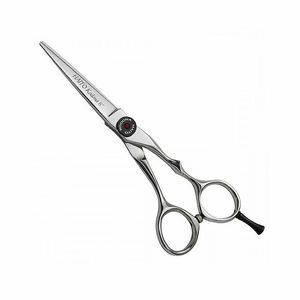 The Kodona's blades are adjusted via a finger-adjustable tension screw so you can set up your scissors just the way you like them. The screw is set with an attractive red gem in its centre to give the Kodona a little extra spark. £71.10 (inc. VAT) Why no VAT? We're a trade wholesaler and quote our prices without VAT to help our VAT-registered customers understand the true cost of a purchase. Sophisticated, continental-style brown scissor case capable of carrying 4 scissors securely with 4 further elastic loops to carry combs or clips too. Measures 13.5 cm wide (closed) x 25.5 cm high and has a magnetic clasp.